Iranian director Jafar Panahi, barred from making films for 10 years by the Iranian government, has still managed to make three films since his imprisonment on house arrest, each more incredible than the last. 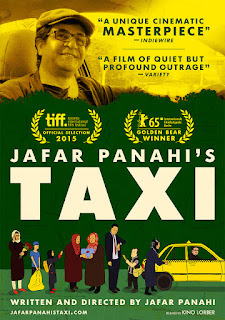 In Jafar Panahi's Taxi (aka Taxi Tehran), Panahi poses as a taxi driver in the Iranian capitol of Tehran, picking up various clients, each with their own unique stories. 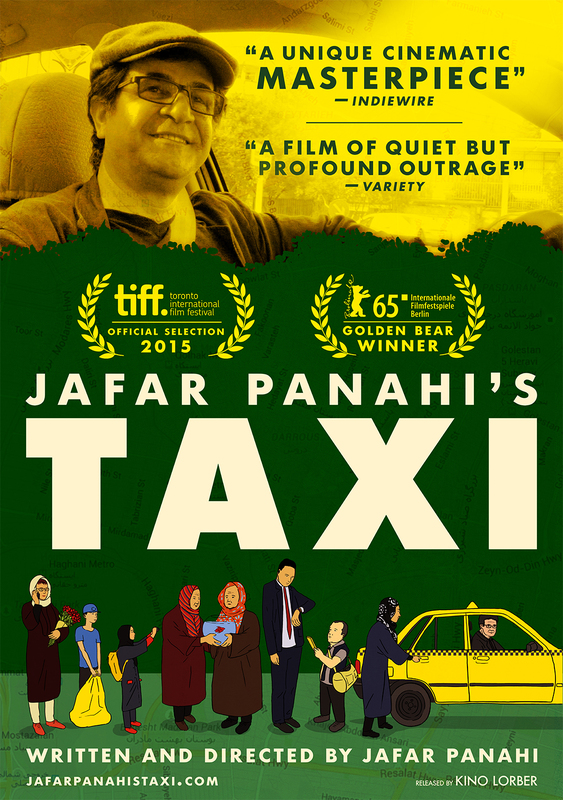 With his trusty camera fixed to his dashboard, Panahi creates an indelible portrait of modern Iran, but perhaps even more surprising, he weaves cinematic gold out of filming himself drive a taxi around for a day. Panahi is a master craftsman who continues to make bricks without straw, turning his punishment into some of the most essential cinema of the decade. Each film he makes is not only a thumb in the eye of tyranny, but a testament to the spirit of human creativity, and the overwhelming desire to create art even when one is barred from doing so. It's joyous, warm, funny, and moving in equal turns, finding humanity in each of his passengers and their own particular missions and world views. As one of Panahi's passengers tells him as she lays a flower by the camera - "This is for the people of cinema, because the people of cinema can always be relied on." Yes they can, and Panahi is a living testament to the fact that tyrants can muzzle a man, but they can never silence art. In The Pearl Button, Director Patricio Guzmán uses water as a metaphoric lens through which to tell the story of Chilean natives, whose ancient relationship with the ocean has been all but lost through systematic subjugation by colonial occupation, in a genocide that lasted well into the 20th century. 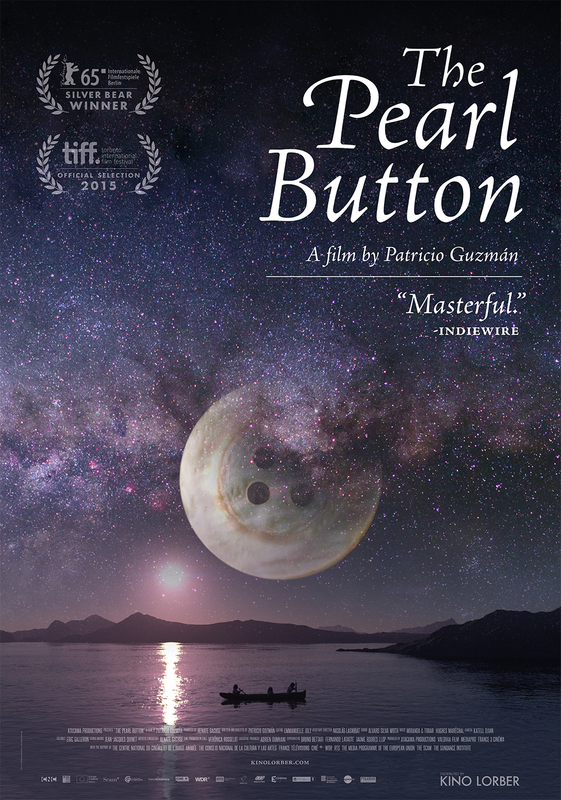 Lyrical and heartbreaking, The Pearl Button is a hauntingly beautiful documentary that is both a celebration of a lost culture (only 20 direct descendants of the Patagonian natives remain), and an elegy for a forgotten genocide that is arguably one of the most ghastly in the history of the world. Yet through Guzmán's unique lens, the history of the natives becomes a kind of ethereal reflection of the universe, irrevocably changed by colonialism and western invasion, moving through the glistening waters of the Chilean coastline like ghosts. Guzmán's placing of the natives' struggles in cosmic perspective makes the film an interesting companion piece for his previous film, Nostalgia for the Light. While the metaphor gets lost in its grandiosity at times, The Pearl Button is nevertheless a deeply moving experience, that tells a story as timeless as the sea itself.